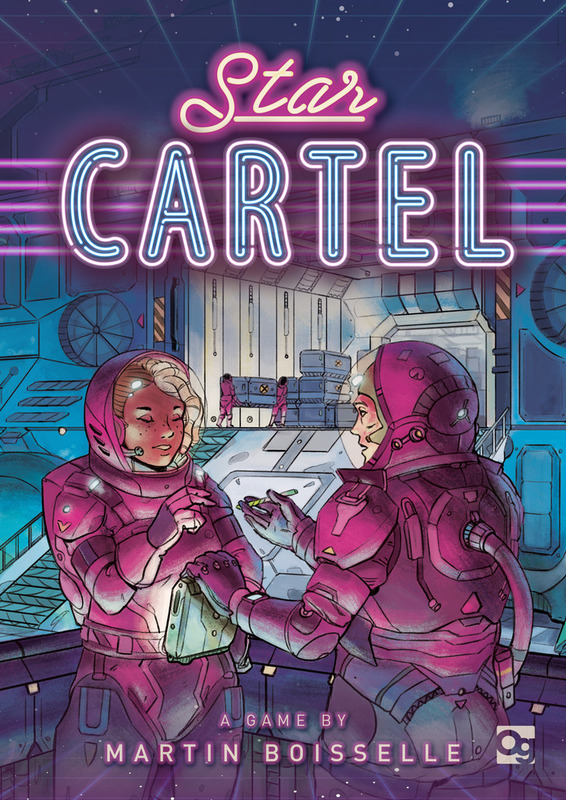 Star Cartel is a game by Martin Boisselle, published by Osprey Games. It is for 3-6 players. In this game, players take on the role of intergalactic smugglers as they attempt to deliver all sorts of goods through the seedy underbelly of the black market in space. Along the way, they’ll be purchasing newer ships with larger cargo holds to carry more stuff, some of which will have special abilities that will help with the delivery of cargo. Of course even in space, the stock market is unstable and is always changing. In the end, the player that can smuggle the most valuable contraband will be declared the winner. To begin, the cartel board is placed in the middle of the play area. The contraband tokens are then placed on the 3 space of the board. Depending on the number of players, some ship cards may need to be removed from the deck. Each player is given a starting ship card. Any remaining starting ship cards are returned to the box. The remaining ship cards are sorted in the deck by capacity with the lowest capacity on top and the Cassiopeia at the bottom. The deck is then placed face up next to the board. The contraband cards are shuffled together and placed face down next to the board. Twelve cards are then drawn from the deck and arranged into 4 columns of 3 rows called the hub. Each column should be lined up with the slots on the bottom of the cartel board. If any of the drawn cards have a size of 4, it should be replaced with a new card and then shuffled back into the deck. The starting player is chosen and play now begins. The game is played with each player taking a turn. Each turn the player will take 2 actions; loading and delivering. The first action is the loading action. To load, the player must first check to see if they have any room to be able to fit any more contraband onto their ship. If it can’t hold any more or there are no cards that will fit on the bottom row of the hub then the player must skip directly to the delivering action. If this isn’t the case, then the player must take one of the contraband cards from the bottom row and place it face up beside their ship card. The player also has the option of taking a second card from the same column as long as it will not overload their ship. The remaining card(s) in the column are then slid down. Once the player has finished loading, they must check to see if their ship is full. If so, they can take the second action and deliver. Otherwise, they must end their turn. The second action is the delivering action. To deliver, the player must group all of their contraband card that they have loaded by type. They will then need to add up the size of each set. The player will then discard the largest set and move the matching token two spaces up on the cartel board. Next they will discard the smallest set and move it’s matching token down one space on the cartel board. If the player has any remaining sets of cards left over, they may choose one set to keep, placing it face down in front of themself. Any remaining sets are then discarded. It should be noted that some times a cartel token will be moved past 9. When this happens, the token is immediately moved down to 1. The player will then replace their current ship with the top card of the ship deck, discarding their old one. It should be noted that some ships have a special ability that can be used during a player’s turn. These abilities are explained in more detail in the rulebook. Once the player has finished taking actions, cards are drawn from the contraband deck to fill the hub back up to 12 cards. Play passes to the next player in turn order. The game continues until a player takes the last ship from the ship deck. When this happens the game ends. All of the remaining players will now take a final turn. However there is one change to the delivery action. Even if a player wouldn’t normally be allowed to deliver this turn, they are allowed to make a rush delivery after loading with whatever goods they have in their ship. A rush delivery only allows the largest type of contraband’s token to be moved up one space and the smallest doesn’t move at all. Once all players have had their turn, the game is over and scoring begins. Each player will now take all that contraband cards in their stash and group them together by type. Each card is then worth as many points as the corresponding cartel token on the board. Players add up the values of each of their cards based on this along with the value of their ship card. The player with the most points is the winner. This game has some very nice looking pieces to it. There’s a nice looking cartel board that is bright and colorful with some great looking designs on it. It’s very thick and sturdy and has a really great finish on it. The designs on the board correspond with the designs on the contraband cards. These are really nice and highlight each of the 5 different goods that the players are trying to smuggle. These cards are smaller like a Euro style card. They have a very nice finish to them as well which makes them very easy to shuffle. That same finish is also present on the regular sized ship cards. These have some great looking ship designs on them. Each one has a differnt paint scheme to it making each ship unique. On the flip side of these cards is the name and ability of each ship. I like that there are unique names for each ship. It adds a nice little touch of detail that wasn’t necessary, but I’m glad that it’s there. Finally there are the contraband tokens. These are plastic and each one has a unique shape and color to distinguish them from each other. There’s also a reference on the picture of each good on the cartel board so that players will know what each token represents. Once again, another nice detail that wasn’t necessary but is very much appreciated. I love the artwork for this game. The designs on the ships and contraband are very cool. I especially love the uniqueness of each ship. Overall this is a great looking game with some excellent designs to it. The rulebook for this game is quite nice. There are plenty of pictures and examples throughout the book, including a great picture of how the game should look when it’s set up. The different card types are explained in detail, as well as the different player actions. There’s also a section where the ship abilities are explained along with the iconography for each one. The book doesn’t have a lot of pages so it doesn’t take very long to read through. It’s also well written and designed. I didn’t see anything that should be a problem or that was difficult to understand. I’m pretty happy with the overall look and design of the whole thing. This is a simple and fun game. It’s really quick to set up and doesn’t take long to play either. It’s kind of a combination of a pickup and deliver game and an economic game. For the pickup and deliver part, well it’s pretty obvious. The game spends a lot of time having you take goods onto your ship and then when your cargo hold is full, you deliver them. The economic part comes in later. As you’re taking certain cargo, the more you have of an item when you deliver will cause that stock price to go up, while having the least of a certain cargo will cause it to drop in price. You’ll then be squirreling away some cargo for yourself in the hope that what you have hidden will be worth a lot at the end of the game. That’s where you’ll be speculating on what’s going to be worth the most when it comes time to score. In some ways it’s going to be sheer luck, but if you really pay attention to what you’re doing and what your opponents are doing, you can work those prices out to benefit you. As an introductory economic game, it’s great. I like that the contraband cards are always changing. What might be there one turn, may not be around on your next turn. You have to figure out the best course of action and just get to it. As I said, the game plays pretty fast and it’s simple enough that new players and even kids can play it. It’s a great family game. For younger players you can even leave off the ship abilities to help them learn the game easier. I think this is a really good game. Fans of economic games like Splendor should enjoy this one. I would recommend this for first time players and families. Overall this is a great introductory game that is really simple to teach. 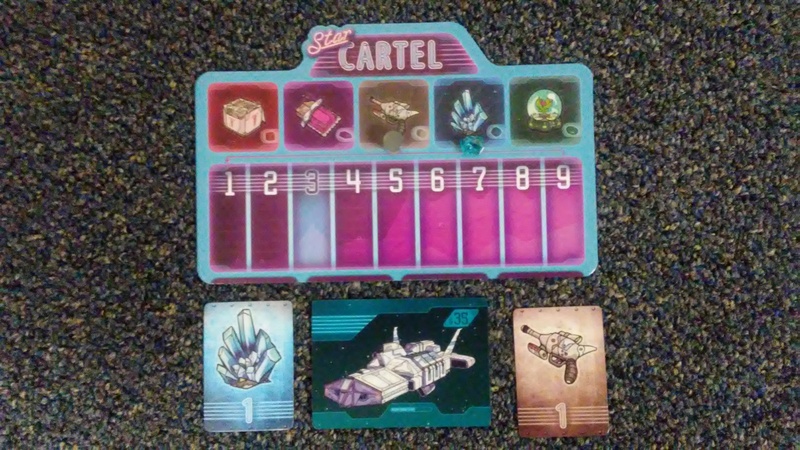 Star Cartel is an introductory economic game that combines elements of pickup and deliver included. It’s a fairly quick and simple game. Most game sessions last around 30-45 minutes. The components are very nice. I like the artwork on all the cards. I especially like the uniqueness of each of the ship card’s designs and how each one has a different name. The rulebook looks great and is easy and quick to read through. The game itself is great for families and as an introduction into economic games. It works well with different player counts, however I find that 3-4 players works best. It does have a bit of luck but with a little bit of strategy it can be controlled fairly well. Fans of economic games like Splendor should really enjoy this one. I would recommend it, especially for families and first time players. Overall, it’s one that most players should enjoy. I like it. Now hold onto these energy crystals for me while the ship’s being inspected. Everything should work out just fine…for me. This entry was posted in Reviews and tagged board, board games, boisselle, card, card games, cartel, games, martin, martin boisselle, osprey, osprey games, star, star cartel. Bookmark the permalink.